In this Photoshop Effects tutorial, we're going to learn how to easily add realistic looking water drops to a photo, as if someone splashed water all over the image. We're going to be using a few filters and adjustments to create some random water drop shapes, and then we'll be making them look like water using a few simple layer styles to add shadows and highlights to them. To finish things off and add an extra bit of realism, we'll be using a displacement map to distort the image underneath the water drops. It may sound complicated but it's all very easy, as we'll see. 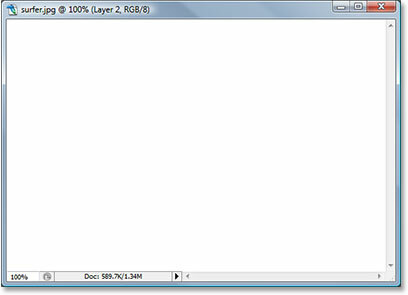 Press "Shift+Ctrl+Alt+N" (Win) / "Shift+Command+Option+N" (Mac) to add a new blank layer. Press "Ctrl+Backspace" (Win) / "Command+Delete" (Mac) to fill the new layer with white, which will also fill your image with white. Go to Filter > Noise > Add Noise to bring up Photoshop's "Add Noise" dialog box. 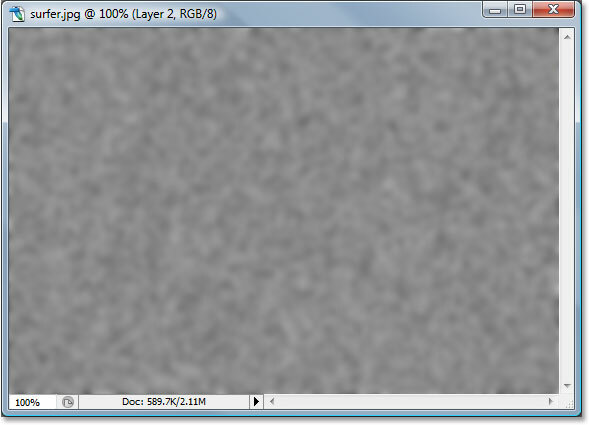 Go to Filter > Blur > Gaussian Blur to bring up Photoshop's "Gaussian Blur" dialog box. The image after applying the Gaussian Blur filter to the noise. Click OK to exit out of the Gaussian Blur dialog box. The image after applying the Threshold adjustment. All the black areas will become our water drops. Apply the Gaussian Blur filter again but at a much lower setting to smooth out any rough, jagged edges around the black areas. 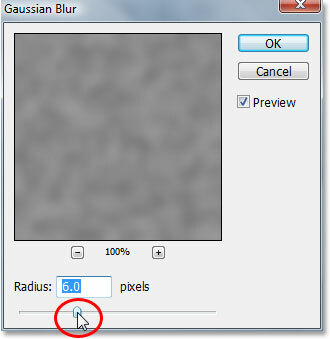 Click OK to exit out of the Gaussian Blur dialog box once again. Click on any black area with the Magic Wand to select all of them at once. Currently we have all of the black areas selected, but what we really want is to have all the white areas selected so we can delete them. All we need to do is invert our selection, which will select everything that is not currently selected and deselect everything that is selected. In other words, the white areas will become selected and the black areas will be deselected. To do that, use the keyboard shortcut Ctrl+Shift+I (Win) / Command+Shift+I (Mac). All the white areas will now be selected. 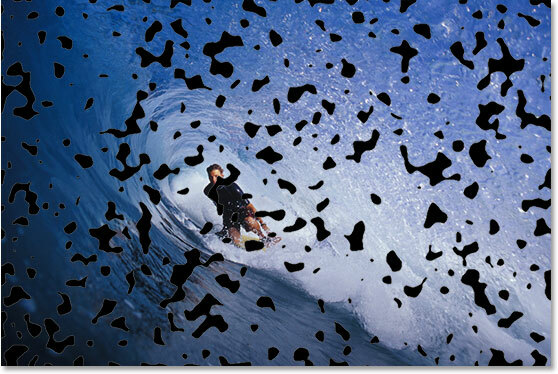 The image after deleting the white areas, leaving only the black shapes which will become our water drops in a moment. 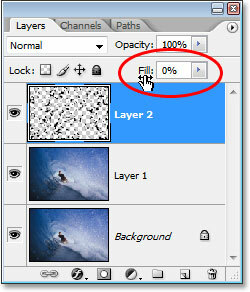 Lower the opacity of the black shapes layer down to 0%. Your black shapes will disappear from view in your image, but don't worry, they're still there, and we're going to be applying our layer styles to them next. Select "Drop Shadow" from the list. Set the options for the Drop Shadow circled in red above. Don't click OK yet. We have a couple more layer styles to add first. Change the "Blend Mode" of the Inner Shadow layer style to "Overlay". Again, don't click OK just yet. We have one more layer style to add. 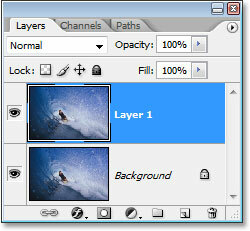 Click directly on the words "Bevel and Emboss" on the left of the Layer Style dialog box. Change the Bevel and Emboss layer style options circled in red above. 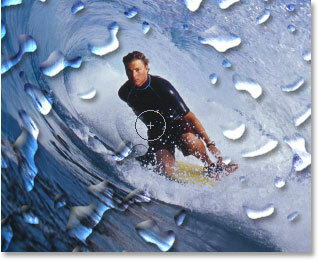 The image after creating the main water drops effect with layer styles. Use the Eraser Tool to remove any unwanted water drops. The basic effect is complete at this point, but we can still make it look a bit more realistic. If this was real water on a real photo, the water would be causing the photo underneath it to look a little distorted, so let's add in that extra bit of realism using a displacement map, which is a scary sounding name for what is really nothing more than a black and white image that we're going to create. 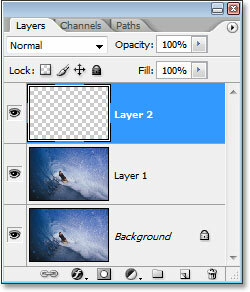 Hold down "Ctrl" (Win) / "Command" (Mac) and click on the water drop layer's thumbnail in the Layers palette. Add a 10 pixel border to the selection. Enter a 4 pixel feather to the selection. When you're done, go back up to the Select menu once again and choose Save Selection. When the "Save Selection" dialog box appears, just click OK to accept the default options and exit out of it. Also, press Ctrl+D (Win) / Command+D (Mac) to deselect your selection around the water drops. Click on the "Alpha 1" channel, which is your saved selection, to select it. 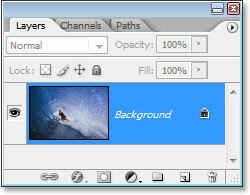 Click on the right-pointing arrow in the top right corner of the Channels palette and select "Duplicate Channel". Click on the down-pointing arrow for the "Document" option and select "New", then click OK. The new document will appear on your screen. This is the document we're going to use for our displacement map. The only thing we have left to do is save it, so go up to the File menu at the top of the screen and select Save As, or use the keyboard shortcut Shift+Ctrl+S (Win) / Shift+Command+S (Mac). Either way brings up the "Save As" dialog box. Name the document whatever you like. I'm going to name mine "water drops", and save the document to your desktop so you can access it easily, since we'll be needing it in a moment. Once you've saved the new document, you can close out of it. We don't need to have it open anymore. Go to Filter > Distort > Displace to bring up the Displace filter dialog box. Click OK to exit out of this dialog box, and a second dialog box will appear asking you to select the displacement map you want to use. Choose the file you just saved to your desktop, then click Open, and Photoshop will apply the displacement map to the layer. 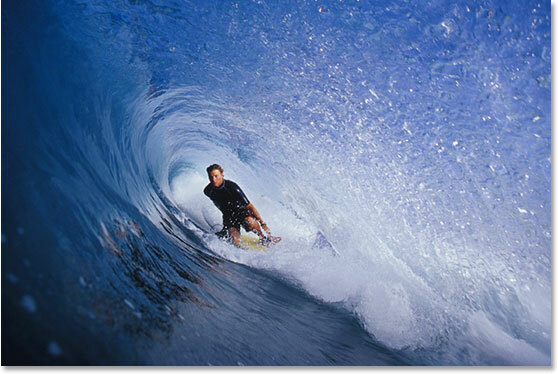 Hold down "Ctrl" (Win) / "Command" (Mac) and click on the water drop layer's thumbnail to select all the water drops. 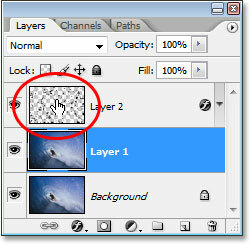 Notice that even though we're clicking on the water drops layer's thumbnail, we still have "Layer 1" selected in the Layers palette, not the water drops layer. All the water drops are now selected in the image. The final "water drops" effect. And there we have it! That's how to add realistic water drops to an image with Photoshop! Check out our Photo Effects section for more Photoshop effects tutorials!